Hi, I am interested in your 1965 Shelby Cobra (stock #5095-CHA) listed on Autotrader for $38,995. I'd like to get more information about this vehicle and confirm its availability. 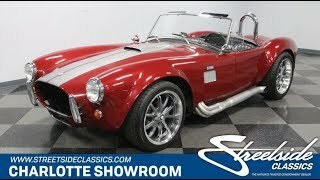 More than just a value price, this 1965 Shelby Cobra Replica is appealing, because they made it a much better drivers car. With a more comfortable interior, four-wheel disc brakes, a fully-independent suspension, and much more, youre looking at a great all-around deal. The look of a Cobra is iconic, so it only gets better finished in a deep and glossy maroon red garnished with a set of gray stripes that have plenty of metallic element to make those flared fender pop in the sunshine. Adding to this shine are great element like the racing-style bumpers, windshield frame, side air vents, and thick roll hoop. For even more distinction you have Halibrand-style wheels that are the stripes are color coordinated from. Not only do they offer that classic sports car appearance, but measuring 18 in diameter, this one looks aggressive, too. Inside are all the completion-inspired elements you love about a Cobra. It has a full gauge package with a large speedo and tach; the steering wheel is nice and grippy; and the classic racing seatbelts provide plenty of function along with their vintage appearance. But what you wont find in many other Cobras is this level of comfort. The way the door panels are finished and the extra plushness of the seats really gives this an extra degree of usability. Under the hood is exactly what you want to see plenty of Ford power. The 302 V8 inhales deeply thanks to the large Holley 600 CFM four-barrel carburetor and a Weiand intake. The headers add even more power as they feed the growling side pipes. Plus, this one has all the right upgrades to harness the power properly. The five-speed manual transmission gives you more great than other to better utilize the powerband. And four-wheel disc brakes mean superior control. In fact, if you noticed the undercarriage photos, the Jaguar-style rear end not only means the rear brakes are inboard for less unsprung weight, but also it means you have a superior fully-independent suspension setup. Everything you want in a Cobra is being offered at a terrific price. So make sure you hurry so you dont miss this deal. Call now!